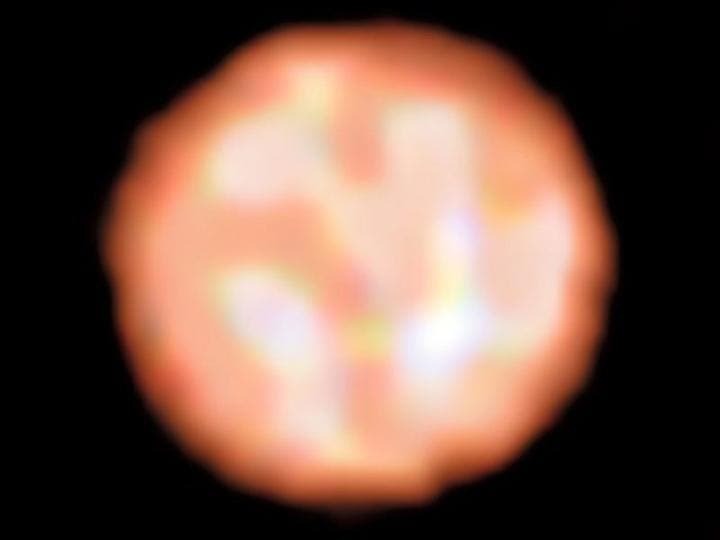 "This is the first time that we have such a giant star that is unambiguously imaged with that level of details," said Fabien Baron, assistant professor of physics and astronomy at Georgia State University. "The reason is there's a limit to the details we can see based on the size of the telescope used for the observations. An international team of astronomers has produced the first detailed images of the surface of a giant star, named π1Gruis, outside our solar system, revealing a nearly circular, dust-free atmosphere with complex areas of moving material, known as convection cells or granules, according to a recent study. The giant star, named π1Gruis, is one of the stars in the constellation Grus (Latin for the crane, a type of bird), which can be observed in the southern hemisphere. An evolved star in the last major phase of life, π1Gruis is 350 times larger than the Sun and resembles what our Sun will become at the end of its life in five billion years. Studying this star gives scientists insight about the future activity, characteristics and appearance of the Sun. Convection, the transfer of heat due to the bulk movement of molecules within gases and liquids, plays a major role in astrophysical processes, such as energy transport, pulsation and winds. The Sun has about two million convective cells that are typically 2,000 kilometers across, but theorists believe giant and supergiant stars should only have a few large convective cells because of their low surface gravity. Determining the convection properties of most evolved and supergiant stars, such as the size of granules, has been challenging because their surfaces are frequently obscured by dust. For this paper, the team used an interferometer. The light from several telescopes is combined to overcome the limitof each telescope, thus achieving a resolution equivalent to that of a much larger telescope." The star π1Gruis was observed with the PIONIER instrument, which has four combined telescopes, in Chile in September 2014. Baron, who specializes in making images, used interferometric data, image reconstruction software and algorithms to compose images of the star's surface. Interferometry is relatively new to astronomy, and Georgia State's Center for High Angular Resolution Astronomy array was the first facility to use interferometry to image a star similar to the Sun in 2007. "These images are important because the size and number of granules on the surface actually fit very well with models that predict what we should be seeing," Baron said. "That tells us that our models of stars are not far from reality. We're probably on the right track to understand these kinds of stars." The detailed images also showed different colors on the star's surface, which correspond to varying temperatures. A star doesn't have the same surface temperature throughout, and its surface provides our only clues to understand its internals. As temperatures rise and fall, the hotter, more fluid areas become brighter colors (such as white) and the cooler, more dense areas become darker colors (such as red). In the future, the researchers would like to make even more detailed images of the surface of giant stars and follow the evolution of these granules continuously, instead of only getting snapshot images.